My father Cpl Everett A. Squires who served in the Army Air Force during WW II as a mechanic on B-17 and B-24 bombers. He was assigned to the 493rd and 447th Bomb Wings while stationed in England. While there he met a lady who he would marry after waiting 5 years, she was able to come to the United States in 1950. He and my mother told stories all the time to me and my brother and sister about their experiences during WWII. 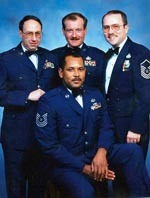 That is the reason there was never any doubt as to which service I would join, it was going to be the Air Force. When he passed in 2005 I saw on his DD214 that he had been separated on Oct 7 1945, exactly 25 years to the day that I enlisted on Oct, 7 1970. I was a civilian printer for the Department of Navy, working in the Pentagon and various other Navy buildings in the Washington, DC metro area. When the draft lottery was held, my birthday came up with a somewhat low number. That is when I decided on the Air Force, hoping I could continue in my chosen trade as a printer. My Agency Director, even requested that I be assigned to the print shop of the Joint Chiefs Of Staff in the Pentagon. I took the bypass test for being a printer in the AF and I never got any results back. I knew I had passed because all the question were about duties I had been performing every day. I asked to see the Squadron Commander and he listened to me, but I never got an answer or even allowed to retest. Like the saying goes “The needs of the Air Force come first”, so I became a Security Policeman. complete the class before New Years. This was the last class that taught both Law Enforcement and Security. The career field was than split into two AFSC’s. I ended up getting my first choice of bases out of Tech School. There was only one opening from the class at Dover, AFB DE. It was the closest to my home. I arrived at Dover on Super Bowl Sunday in 1971 with the Baltimore Colts and the Dallas Cowboys, playing. I watched the game from the transient barracks. I was assigned to Security since I had completed SP tech school, while the other guys I processed in with had been washed out of their tech schools and they all got Law Enforcement. I was only at Dover a couple of months when I got orders for South East Asia (SEA). After TDY back at Lackland for AZR Combat Training, I returned back to Dover for only a couple of weeks. 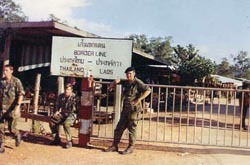 I arrived at Ubon RTAFB in late June of 1971. I was assigned to what was called Shadow flight, the largest flight that worked the high threat hours at night. I performed various assignments before I was selected to train as a 81 mm mortar gunner I never did get to go to a formal mortar school, I was transferred to the Heavy Weapons section when it was first formed and I spent most of my time working the mortar pit with an occasional assignment on a Quick reaction Team as either a M-60 or 50-cal machine gunner. The base was attacked two times, while I was there. One was a single sapper who was killed before he could do any damage. Two of my friends would receive Bronze Stars for their actions that night. The other was a stand off mortar attack, which targeted the AC-130 parking area. I extended my tour twice during the Spring Offensive of 1972 and left Ubon just after Linebacker II started and was actually home for Christmas. My next assignment was to Malmstrom, AFB, MT. I was trained to work as a Flight Security Controller and was assigned to a 10th Missile Security Flight. While there I was promoted to E-5 SSgt with less than 4 years in service and had 11 months Time In Grade when I was discharged. During that time I was given the opportunity to attend project transition. I approached the MSgt who was in charge of the base print shop and I proceeded to tell him that I was capable of operating all the equipment in the shop and he would not need to training me at all. His shop was short one billet so he agreed. I worked there for about six weeks and I had to go back to being a cop for the remainder of my enlistment. This time it was with the 490th Missile Security Flight, where I worked at the farthest site from the base, 150 miles and a three hour drive. I always wondered if it was because I took that transition assignment. I was discharged in October 1974 and my brother flew out to Montana and we drove home to Virginia together and we got to see some of the country. I went back to work at my old job as a printer for the Department of the Navy .After being out of the Air Force a few months I started to miss being a part of it. I still had my 2 year reserve obligation and I figured I would use it as an active reservist. I contacted an AF Reserve recruiter and I enlisted in the Air Force Reserve as a veterinary technician in the 22 Medical Services Squadron at Andrews AFB. This unit was a part of the 459th Airlift Wing. It was the only position available that I could keep my SSgt rank. I never really got any training as a Vet tech and after a few months the veterinary positions were all turned over to the Army so I had to find a new slot. My only Annual training with this unit was helping do physicals for dependent children for the upcoming school year. Basically helping get the children rom one station to another. I tried to transfer to the 459th Security Police Squadron but they had no slots for an E-5 at that time and could not take me as an overage. I went down the road to the District of Columbia Air National Guard and enlisted there for a 3 year term as a Security Policeman. I had to enlist for three years, and when that was up, I made up my mind to make it a career. I am very glad I did. I retired there after a total of 21 years. During my time as a member of the 113th Weapons System Security Flight and the 113th Security Police Squadron, I participated in three Presidential Inaugurations, Jimmy Carter, first one for Ronald Reagan, second one was canceled due to extreme cold, and George H. W. Bush. Carters we work as additional members on patrol with the DC Metro Police. The one for Bush we worked traffic control. 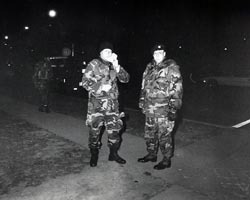 During Ronald Reagans, we worked with the DC Army National Guard MPs as part of the riot control team. When the Army Commanding general decided that we should be deployed, he left the Army MPs at the DC Armory and took just the Air Force Security Police. Nothing happened so we just stood by at the parade route. I also went to two overseas deployments; RAF Station Finningley, and NAS Keflevik. Other Annual Training was held in Savannah GA, Alpena MI, Langley, AFB and Key West, NAS, FL. During Desert Shield/Storm I volunteered for additional active duty. One night after the call for members to report, I went straight to Andrews and was assigned to provide security for the aircraft of the 113 TFW. I did this for several months and continued to also work additional Anti Drug missions as well as our regular monthly drills. Plus working at my civilian job in the Pentagon. I also got to visit a few other ANG units, including those in Virginia, West Virginia, and Nebraska. Myself and two other Security Policeman went TDY for a few days to learn from our counterparts at our Advisor base at Seymour Johnson AFB. NC. 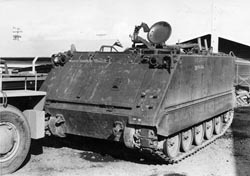 We did not get much accomplished as our host unit the 4th SPS, got put on alert as the Grenada Operation started that day. My last day in the DCANG was performing a Light All mission on Halloween night October 1991.
two times during my time there. I was never actually involved in any combat operations myself. After being at Ubon for about six months, in early January 1971, I was awakened one morning after working all night and told to report to the 1st Sgt. When I got there I was told that the Red Cross had contacted the Air Force and that my mother had passed away. Of course I ended up taking emergency leave to attend her funeral. My family wanted me to apply for a humanitarian reassignment, which I did. But the Air Force said no. So back to Thailand I went, which took me a while because I was on stand by all the way. From Travis, AFB I was on a C-5A and got put off at Hickam, AFB, because of Special Cargo. I then boarded a C-141 which blew an engine getting ready for take off. I ended up three days later on the same aircraft and finally got back to my base. Not only did I finish my tour, but I did two three month extensions due to the increased efforts of the enemy in Vietnam. 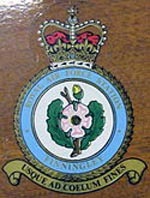 It was my deployment as a member of the DCANG to Royal Air Force Station Finningley. My mother was from London, and she and my father met during WW II while he was part of the 8th Air Force. While there I was able to travel to London. Here I met up with a cousin and her husband and took the train to their home. The next day we traveled out to the coast to visit her mother where I also got to meet another Aunt. My least favorite memories were at Dover, AFB, DE working in the Weapons Storage Area (WSA) having to walk on top of the mounds during hours of darkness. Day shift was fine as we got to patrol in a vehicle. 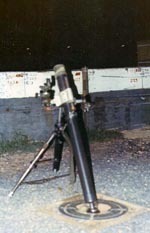 My time as a mortar gunner while a member of the 8th SPS, Ubon, RTAFB. I really looked forward to having nightly fire missions. 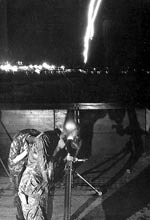 We just about always had a fire mission shooting illumination rounds to light up the perimeter at night. 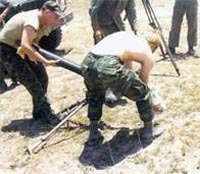 I hated it when a round did not go off and we had to clear the mortar tube by disconnecting it from the base and turning it upside down with one person catching the round and making it safe. The Air Force Achievement Medal. I received it for performing addition duties while supporting the Washington DC Metropolitan Police Department and DC National Guard Anti-Drug Program. We performed Light All missions. We would go to street corners and set up lights to deter the efforts of drug dealers and give the local residents an opportunity to feel safe in the neighborhoods. As well as Light All missions, we also worked other events. Two of those were at RFK Stadium. They were concerts by The Who and The Rolling Stones. I got to go to the front of the stage for a while and got to see Mick Jagger up close. What more can you ask for , getting paid and seeing Rock Stars for free. Supporting the Anti-Drug program was probably the most important thing I did during my service as a member of the Air National Guard. My Vietnam Service Medal, and Vietnam Campaign Medal are very important to me because they allow me to be part of the Vietnam Brotherhood for which I am so proud of. I have become friends with some of the finest people around, the members of the Vietnam Security Police Association (VSPA). I was chosen to carry the flag of Thailand as a member of the color guard of the VSPA. at the 25th anniversary of the Vietnam Wall in 2007 held in Washington, DC. That Veterans Day will be the one I remember the most. I was proud to march with heroes. SSGT Lindsay Hall. He was the Assistant Flight Chief of the Heavy Weapons Section at Ubon, RTAFB. He came to Ubon from a base in Vietnam that was closing, I do not remember which one. We were so lucky to have him and the others who came with him as we learned a lot from their experiences. He did so much to establish the section and make us proud to be part of it. We even got to wear distinctive head gear, the Aussie Bush hat. 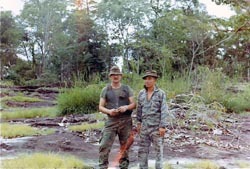 One of my best friends was James Wilson, a roommate of mine at Ubon, RTAFB and fellow member of the Heavy Weapons Section. He and I both had follow on assignments to Malmstrom, AFB working Missile Security. We worked different shifts and different flights. After many years I found out where he lived and sent a letter. We have talked on the phone but have never gotten back together. But of course I will remember him as a brother forever. 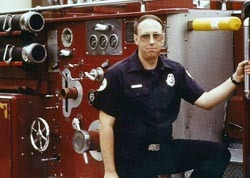 James Mahaffey who was also a member of the Heavy Weapons section and I connected and communicated for several years and he visited my wife and I while traveling around the country. We visited the Air Force Memorial and the Vietnam Memorial Wall. He passed away a few years ago from Agent Orange related illness. His profile is one of my remembered Airmen. Rest In Peace “Wolf Pack Defender”. I stay in touch with several of my friends from my time in the DC Air National Guard. We keep talking about getting together again, but it never seems to happen. Maybe some day. doing. He decided to drive through a pond and the tracks must have got stuck on a log or something and we could not move it in any direction. I think the drain plugs were not put in and the water started entering the inside . I called Central Security Control (CSC) many times asking for assistance from the other track to pull us out as the water kept filling in. Believe me I tried real hard not to sound desperate. The other track was busy pulling out a stuck 2 1/2.ton truck. Finally the Thai Guards all got on the top. By the time we got help the whole thing was filled with water. We carried everything out including the machine guns (50 Cal) and all the ammo in water up to my arm pits. I was “asked” to report to maintenance first thing the next morning and clean up the mess. I don’t remember what happened the with the rest of the shift, but I know that we did not get the rest of the night off. Early the next morning I reported in my stateside fatigues all set to go, but was told not to worry about it that it had already been taken care of. Our maintenance section was great as it was back in service just a few days later. I figured I would be working without a paycheck for the rest of my enlistment. But nothing was ever said about it. I kept my stripes and I even made E-5 when I got back stateside. It was a while before I went back on a QRT, It was either the mortar pit or Fire Direction Control (FDC), which I never had any real training on. Than again I never got to go to mortar school either. Just a day working with our training section, running up and down a filed setting up the mortar including the aiming stakes and setting coordinates on the sight. But I really did like the mortar pit when we finally got to fire live missions every night. Back then during a war I suppose things were different. Not funny then, but I can laugh about it now. After discharge from the Air Force, I went back to my job as a printer for the Navy. The Agency later became part of the Defense Logistics Agency. I transferred to the Government Printing Office and retired after 42 years of Federal Service in July of 2010. I am a Life member of the Alexandria Volunteer FD and still participate. I am going into my 45th year as a member and serve as the Department Treasurer. I am a Life member of many military associations. I am proudest of the Vietnam Security Police Association. We have experienced a lot of the same things, both in South East Asia and stateside assignments. I have met very few people who I actually served with, but have become friends forever with all of them. I participate with my Vietnam Veterans Association Chapter 641 and with Eagle Chapter of the USAF Security Forces Association in washing the Vietnam Memorial Wall. We do this once a month during the period of April -October and sometimes twice a month when both associations have a scheduled date. There is no better satisfaction than having the privilege of washing “Our Wall”. I think that my core values were reinforced by my military service along with working as a civilian for the Department of Defense. I learned a lot about leadership, as even when you are not a high rank, you still are given a lot of responsibility. This helped me not only as I progressed in my Air Force career, but also helped me in being a good supervisor in my civilian career. The thing I remember most from the Air force was they stressed to always treat the people that work for you as your greatest asset. Without them nothing gets done. Being a Vietnam War veteran, I am part of a brotherhood who believes that no generation of veterans shall ever be forgotten. No matter which service or where you have served, you should be proud of what you have done. My hope is that those now serving will continue to feel the same way. Be proud of the uniform you wear as it reflects not only on you, but of all those who have worn it before you. You would be wise to pay attention and listen to those who have served longer than you and pass that information on as you advance in your career. Just like most of the military associations I belong to I have not made contact with many people who I served with. I have made friends with lots of new people with whom I can share the Air Force experience. It has been wonderful to get together with people who only have the Air Force in common and feel like you have known them forever the first time you meet face to face. 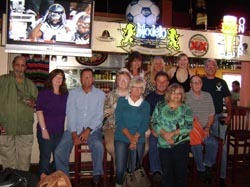 On several occasions I have had mini reunions with people I have initially met here at TWS, traveling to events and actually meeting others who are traveling and meeting up with them, beginning with our 1st get together in Frederick, MD.